The T-Shirt below right there, says it all. This was at a summer pool party in Ibiza during the summer of 2017, where in true Vikki style, myself and the group of ladies I was with, pushed our way through the crowds, multiple Malibu Pineapple drinks in our hands to the very front of the stage where Craig David would be performing. We took our position front row and we were not disappointed. He was phenomenal. The T-Shirt he wore really stood out to me, ‘What A Time To Be Alive’ it said and it really is . Right NOW, I believe is one of the most exciting times to be alive and the vivid memory of that summer concert will stay with me forever, however long that forever is. What though, if forever was limited (because it is)? What if forever ended tomorrow? TODAY is the only time to be alive, because today is what you have. Yesterday I heard some very sad news that someone within my friendship circle, a wonderful human being who had a real zest for life, a warm heart and so much passion inside them had passed away suddenly, without any warning. Suddenly, in a few moments, everything changed for that person and the family that they leave behind. This kind of devastating news hit’s you like a brick. It takes your breath away and it makes you question everything. I wanted to write this, to encourage anyone reading this to think about this; Are you doing today what you would be happy to take to your deathbed tomorrow? I know this sounds incredibly morbid, but I really believe it is one of the most simple and fundamental ways of thinking in order to live a life that you absolutely ADORE; Every. Single. Day. As human beings, we can really complicate the process of life. We can make it very difficult and pressured, when in fact, it really can be one of the most simple things, if only you allow your mind to think this way. Ok, so my sensitivity to the things I saw yesterday was heightened and I saw multiple messages that aligned with the thoughts I was having. It makes you think doesn’t it. 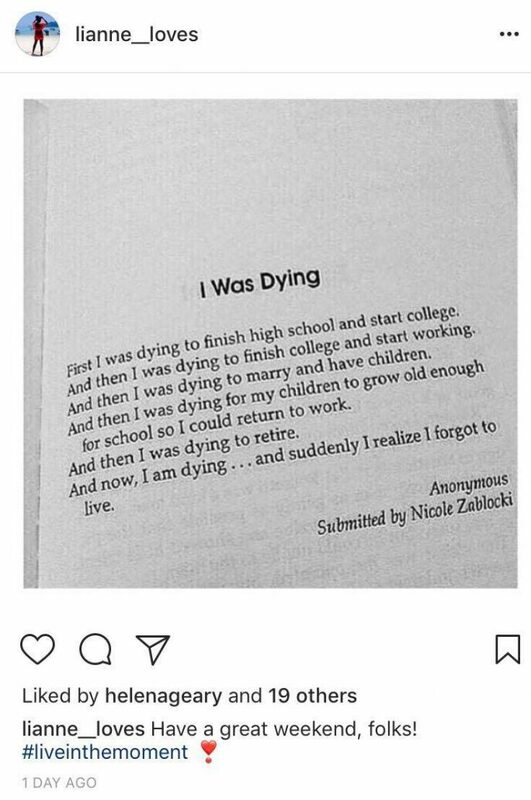 ‘And now, I am dying …. and suddenly I realise I forgot to live’. Remember those words, because I believe remembering those very words could change the way you live your life. I am very fortunate in the career I have created for myself, that I get to meet so many people who are creatives too. So many people who are exceptionally happy with what they do with their lives, every day. I also meet SO many who are not. I see too many people who are unhappy with where they are. I see too many people with an ‘I wish’ rather than ‘I will’ mindset. YOU get to write the story of your life today and that is such a beautiful and sacred thing. You have been given today, so make sure that whatever it is that you do today, that it is something that set’s your soul on fire. OK, so for any negative folk reading this (and I promise I am not being rude when I write this) please take a minute to stop, think and hold that negative thought right where it is. There are many, too many people in the world who would read something like this and say, that’s alright for her or him or whoever, BUT my situation is X, Y or Z. That BUT word is a killer you know. You cannot compare your today to anyone else’s today, so STOP trying. If you can’t find the joy in your own today, then for goodness sake don’t be negative and take the joy out of someone else’s. The truth is, everyone has a cross to bear, things they would like to change and the world isn’t always ideal or kind. For example, you may be in a job that you hate and you may not be able to change that today, but, if you can find joy in a tiny moment today, DO IT. Do it for you, for those you love, to make a difference in this world and leave it a little bit brighter than it was before you woke up this morning. Because, the reality is, it may be all you have. So, if you can’t love the heck out of today, then at least take a moment, smile, be grateful and find some magic, a moment of magic in it’s simplest pleasures. TODAY, really is the best time to be alive. Living in the present moment, really living in it, is the only way to really enjoy it. And if you are not enjoying it and living it like it really f*cking matters then CHANGE IT. Because it really does f*cking matter. A LOT. Only you get to choose what you live. So choose life. Choose the one you want to live, TODAY.